The air outlets and air volume change according to the selected airflow mode. slide the knob to the most outward position. Therefore, the fan may stop for a while until warm or cool air is ready to flow immediately after is pressed. air from the outlets and defog the windshield effectively. windows may fog up more easily. 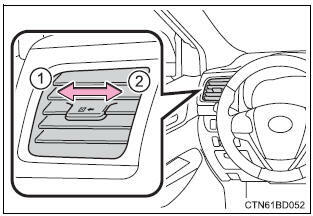 Recirculated air mode is selected as a default mode when the engine switch is turned to the "on" position (vehicles without a smart key system) or ignition on mode (vehicles with a smart key system). Settings (e.G. 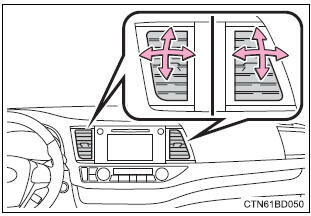 A/c auto switch operation) can be changed. cool air operation in extremely humid weather. 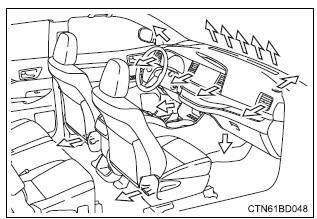 Do not place anything on the instrument panel which may cover the air outlets. Do not touch the glass at lower part of the windshield or to the side of the front pillars when the windshield wiper de-icer is on.